Reviewed by Chloe Campbell, Times Literary Supplement, 2 December 2011. 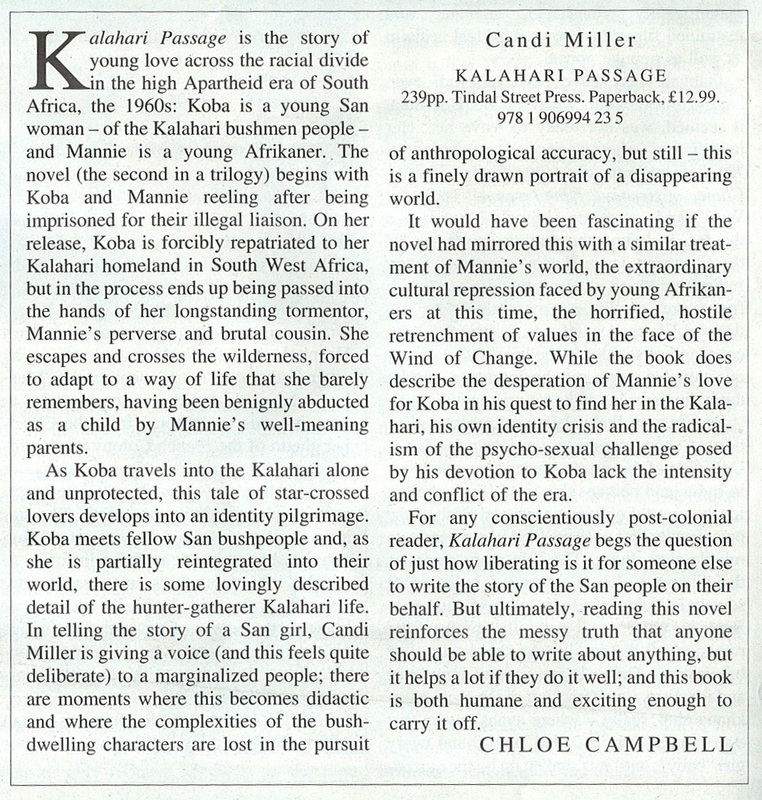 Kalahari Passage is the story of young love across the racial divide in the high Apartheid era of South Africa, in the 1960s: Koba is a young San woman - of the Kalahari bushmen people - and Mannie is a young Afrikaner. The novel (the second in a trilogy) begins with Koba and Mannie reeling after being imprisoned for their illegal liaison. On her release, Koba is forcibly repatriated to her Kalahari homeland in South West Africa, but in the process ends up being passed into the hands of her longstanding tormentor, Mannie's perverse and brutal cousin. She escapes and crosses the wilderness, forced to adapt to a way of life she barely remembers, having been benignly abducted as a child by Mannie's well-meaning parents. As Koba travels into the Kalahari alone and unprotected, this tale of star-crossed lovers develops into an identity pilgrimage. Koba meets fellow San bushpeople and, as she is partially reintegrated into their world, there is some lovingly described detail of the hunter-gatherer Kalahari life. In telling the story of a San girl, Candi Miller is giving voice (and this feels quite deliberate) to a marginalized people; there are moments where the complexities of the bush-dwelling characters are lost in the pursuit of anthropological accuracy, but still - this is a finely drawn portrait of a disappearing world. It would have been fascinating if the novel had mirrored this with similar treatment of Mannie's world, the extraordinary cultural repression faced by young Afrikaners at this time, the horrified, hostile retrenchment of values in the face of the Wind of Change. While the book does describe the desperation of Mannie's love for Koba in his quest to find her in the Kalahari, his own identity crisis and the radicalism of the psycho-sexual challenge posted by his devotion to Koba lack the intensity and conflict of the era. For any conscientiously post-colonial reader, Kalahari Passage begs the question of just how liberating is it for someone else to write the story of the San people on their behalf. But ultimately, reading this novel reinforces the messy truth that anyone should be able to write about anything, but it helps a lot if they do it well; and this book is both humane and exciting enough to carry it off.